Lightning strikes are by far the most powerful, most dangerous and most damaging form of transient voltage. These strikes can have energy of up to hundreds of thousands of volts and currents of hundreds of thousands of amperes. Different types of strikes will have different levels of energy thus resulting in differing degrees of damage to the affected structures and their electrical systems. Most lightning damaging transients are caused by a strike to the power system, data or telecommunication lines. Surge damage can also be induced by a strike to the facility structure or nearby separate structure that is connected by a common data, telephone or power line. In 2016, according to the Insurance Information Institute, over $825 million was paid out in damage claims to homeowners alone. Strikes to the ground (your yard) or cloud-to-cloud events should also be of concern, especially if your equipment is unprotected. These events can create very strong and damaging surges that can bring havoc to an unprotected electrical system and it's unprotected electronic devices. These strike scenarios may not be as powerful... damage wise... as a direct strike to a building structure. However, they can be as dangerous to your equipment none the less. Strikes to earth ground can produce very strong transients. Ground surges produced from nearby strikes can destroy electrical systems. They can enter unprotected circuits through the facility ground, equipment systems ground or any conductive material connected to your building (pipes, conduit etc). Distance cloud-to-cloud flashes can also produce transients in the electrical distribution system. Cloud-to-cloud lightning is capable of inducing electrical field intensities in the hundreds to thousands of volts. If this happens across an unprotected power, telephone, data or coaxial line, the result can be severe system damage or complete destruction. With the potential for lightning damage, everyone should be prepared. Structural lightning protection systems (lightning rods) are designed to mitigate the damage to your business or homes structure from lightning strikes... and are a great asset. However, without the correct lightning surge protectors for commercial, industrial and residential locations, your valuable and sensitive electronics will not survive the next strike event. The National Lightning Safety Institute (NLSI) recommends surge protection. Here, the NLSI provides some general guidelines for protection applications. Lightning strikes are instantaneously damaging. These events are very costly to the entire electrical system. Mitigation techniques should be viewed as a necessity - Not viewed as an option. 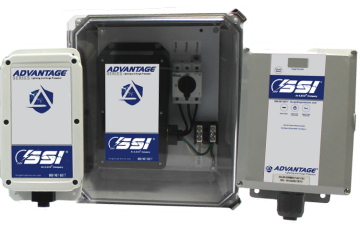 Take protective measures with High Quality, High Performance surge suppression equipment and TVSS systems. Mitigate and prevent damage to your critical systems. Learn more! View our informational videos.